Reproduction Art Prints from Famous Manga Dragon Ball: The Complete Edition Debut Overseas! North American Sales Begin on Japanese Pop Culture Site Tokyo Otaku Mode! 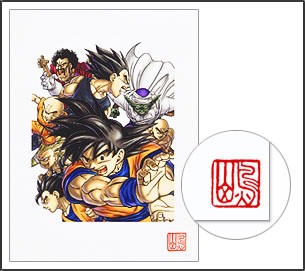 Reproduction Art Prints from Famous Manga "Dragon Ball: The Complete Edition" Debut Overseas! North American Sales Begin on Japanese Pop Culture Site Tokyo Otaku Mode! TOKYO – Tokyo Otaku Mode Inc. (incorporated in Delaware, U.S. by President and CEO Tomo Kamei), the managing body of Tokyo Otaku Mode™ (TOM), a worldwide distributor of otaku content including anime, manga, and cosplay, proudly announces the release of reproduction art prints from the huge worldwide hit manga “Dragon Ball: The Complete Edition”. These reproduction art prints from “Dragon Ball: The Complete Edition” by manga artist Akira Toriyama have been made available for sale in the U.S., Canada, and Mexico through Tokyo Otaku Mode’s ecommerce site, the Tokyo Otaku Mode Premium Shop (http://otakumode.com/shop/pickup/dbgenga). This marks the first time these reproduction art prints have been made available for purchase in North America, and the first time they are available overseas through an ecommerce site. These reproduction art prints are of art created by Akira Toriyama specifically as front cover illustrations to the manga “Dragon Ball: The Complete Edition,” which released in 2002. The prints utilize a fully digital printing technique that is the highest quality printing technique in Japan known as “Primagraphie.” Prints of each of the series’ 34 front cover illustrations are available, and each one features Akira Toriyama’s name stamp, making them collectable items of great value for fans. These reproduction art prints first released in Japan in 2003 and have since been unavailable for sales overseas*. Now, more than 10 years later, fans in North America will finally be able to own them. “Dragon Ball” is a long-running manga depicting the adventures, strength, battles, and friendships of main character Son Goku as well as the pursuit of the Dragon Balls, treasured items that can grant any wish when all seven are collected. It was serialized in Shueisha’s weekly publication “Weekly Shonen Jump” for roughly 10 and a half years, from 1984 to 1995. Worldwide, the series has more than 230 million copies in print, and it is a huge hit that is loved the world over. The series doesn’t just encompass manga, but also TV anime, animated movies, a Hollywood live-action movie, games, and more. For many years, it has reigned as a symbol of Japanese manga and anime, and even to this day, it has a huge fanbase all over the world. The “Dragon Ball: The Complete Edition” reproduction art prints by Akira Toriyama that are being sold on the Tokyo Otaku Mode Premium Shop are original products created by Shueisha Inc. that are available for overseas sales for the first time. To date, products made available for overseas sales by TOM on the Tokyo Otaku Mode Premium Shop include manga- and anime-related goods, as well as a variety of original goods created in collaboration with creators both within Japan and abroad who are active on TOM. Since the Tokyo Otaku Mode Premium Shop opened last summer, it has shipped products to more than 60 countries. From here on as well, TOM will expand the amount of products available on the Tokyo Otaku Mode Premium Shop and offer even more products to attract overseas customers. TOM will continue seeking out collaborations with domestic and foreign businesses and organizations as well as creators to offer new value to the worldwide entertainment market. Tokyo Otaku Mode™ (TOM) is a worldwide distributor of otaku content––including, anime, manga, cosplay, and otaku entertainment news. TOM is owned and managed by Tokyo Otaku Mode Inc., which was incorporated in Delaware, U.S. in April 2012 by President and CEO Tomo Kamei. TOM began on Facebook on March 24, 2011 as a page for introducing to the world Japan’s otaku content––including anime, manga, games, and goods, as well as the latest news and event reports (http://www.facebook.com/tokyootakumode). A mere 22 months after its Facebook page was established, TOM surpassed 10 million likes to become the first Facebook page managed by a Japanese company to clear this milestone***. In the fall of 2012, TOM launched its web service Tokyo Otaku Mode β (http://otakumode.com), which includes a user-generated content (UGC) platform on which Special Creators can upload their own otaku creations––such as cosplay, illustrations, figure photos, and latte art––as well as a news page for delivering to the world the latest news on otaku culture straight from Japan. *Excluding limited sales at an event held by Shueisha Inc. in China. **Sales of this item on the Tokyo Otaku Mode Premium Shop are limited to those in the U.S., Canada, and Mexico only. ***According to research conducted by Tokyo Otaku Mode Inc.